Despite the name, Minor Key Games’ cyberpunk espionage thriller is bathed in the ambiguous greys of Thief and Deus Ex. Neon Struct casts you as Jillian Cleary, Agency agent, in a spy-thriller presented with a cyber-brutalist aesthetic which manages to be evocative while remaining cleanly readable. Fluorescent pinks and greens are cast across monolithic structures of grey concrete; a visual spectacle that evokes the The Dark Engine as seen through an electronica lens. This spans the soundscape, too; from its opening moments, Neon Struct’s main theme instantly brings to mind Alexander Brandon’s Deus Ex soundtrack, an evocation that sets a high bar the game strives for but never manages to fully grasp. 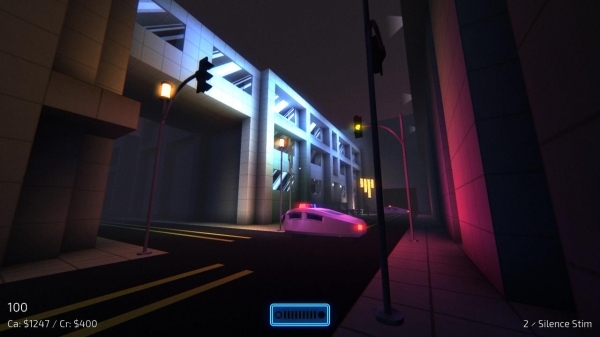 At a high level, Neon Struct is a series of discrete missions linked together by public city spaces where you are free to explore and talk to wandering NPCs. The sense of the familiar continues once you enter your first mission. Though the visual metaphor used throughout the user interface is different, the role of the light meter at the bottom of the screen is unmistakable to anybody with even limited experience of Thief: The Dark Project or its successors. 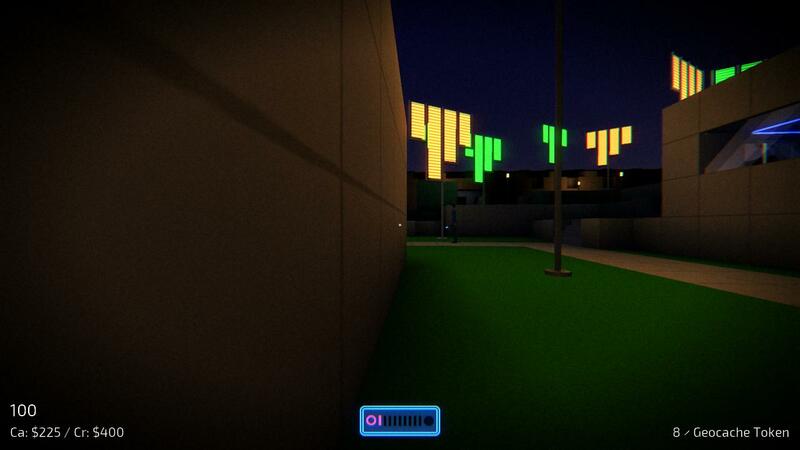 Like those games, illumination and shadow form the core of Neon Struct’s stealth system. Remain in the deepest shadow, the light meter at its lowest level, and NPCs will walk right past without even registering your presence. At its fullest, with the solid circle filled in bright pink, Jillian will be spotted by any passing NPCs – though range can offer some leeway in terms of immediate detection. Between these two extremes is where the play of the stealth system resides; it’s often trivial to find a location where you can remain entirely in shadow, but if you are to complete your objectives you will need to move, to risk exposure as the light meter enters that ambiguous space between its two extremes where detection is possible and decisions occur on a scale. Moving forward a few steps will allow you to reach that door, but doing so will make you more visible – will that be too visible? Can you hack the lock on the door before the guard’s patrol route brings her back here? If she does, will she pass close enough to detect you? Should you risk using one of your rare anti-light grenades, or save it for later? At its best, even the smallest decision is a focal point from which choices and consequences cascade outward. Sound also plays a role, though a reduced one compared to the likes of The Dark Project. Surfaces have some impact on the sound of your footsteps, though it is speed that plays the biggest role in terms of the ability of NPCs to detect you. Along with walking, you can also crouch, which lowers your visibility at the expense of movement speed, or sprint. The latter is the fastest and therefore the most audible, however crouching mid-sprint will initiate a slide that allows Jillian to cover several feet completely silently. 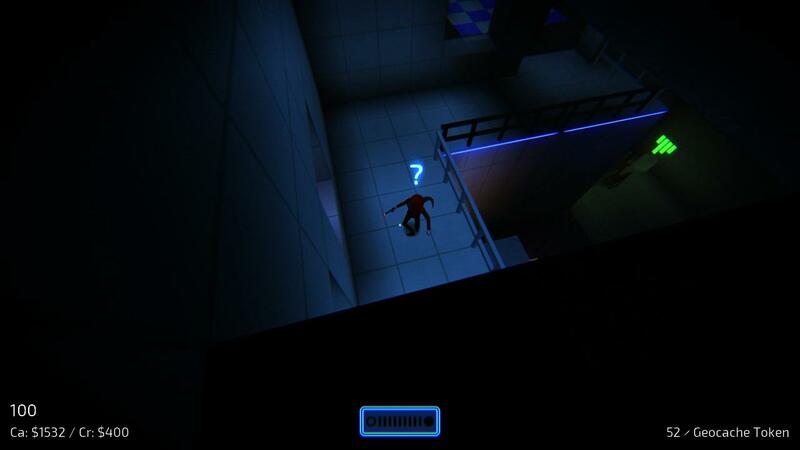 Neon Struct naturally encourages you to fall into the same thought patterns as those immersive sim classics. 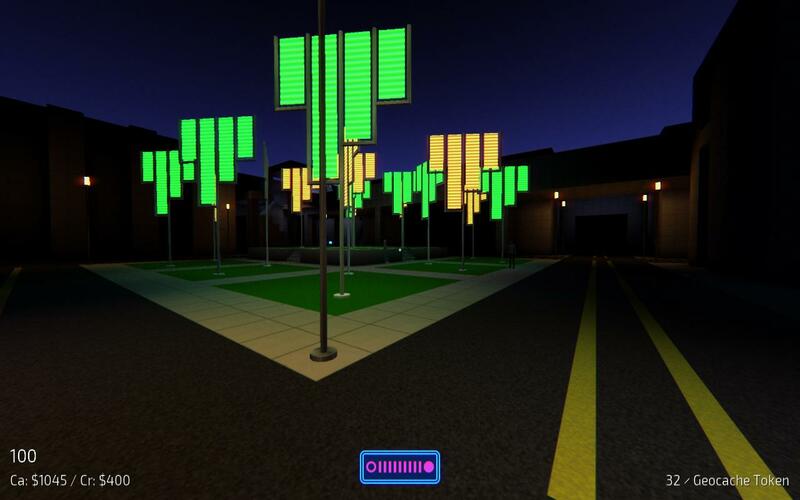 Combined with the clear art style that serves to make the environment readable even from a distance (there are some occasional exceptions to this, unfortunately), Neon Struct’s pared down moveset serves to increase the overall pace of the game. Though most of your time is likely to be spent crouching, the sprint and slide provide a means of rapid traversal that can be used either proactively to close the distance to an object of interest, or reactively to slide into cover before an approaching guard rounds the corner. Along with the sprint and slide, Jillian is able to mantle up onto walls and other surfaces at or below head height, and lean around corners to observe the area ahead while remaining mostly concealed. Proactive and reactive, intentionality and improvisation; this is the heart of the immersive sim model of stealth – and Neon Struct understands this. The first level, a large open space in front of the building you need to infiltrate, with guards patrolling across the paths between patches of grass, immediately recalls Deus Ex’s opening level, Liberty Island. Most levels start in this manner, with you approaching an objective from the outside, granting you space and time to observe the area ahead before taking action. Intentional play will take you from the starting position to the target building itself where, despite the abundance of glass, your ability to determine the layout and movement of NPCs inside is limited and you will be forced into a more improvisational style of play. Neon Struct naturally encourages you to fall into the same thought patterns as those immersive sim classics. The level starts and you’re standing on a street looking at your target, your eyes immediately drawn to the patches of shadow. These are the obvious points of ingress – but are they the best? NPCs are patrolling the grounds; as you watch, you determine a gap in their patrol routes. It’s not for very long, and you’ll risk exposure from any other NPCs you might not have seen, but it’ll get you to that side entrance. You’re inside now, moving slowly, hugging the wall, using the extra bit of darkness there to conceal yourself, or hiding in the shadow of doorways while NPCs walk past, barely inches from your position and yet totally oblivious. Though hardly realistic, it’s entirely consistent with both the rules it has established, and those rules that governed light and shadow in The Dark Engine. AI states are communicated through clearly differentiated animations, supported by optional visual indicators. Jillian will have to avoid a variety of NPCs over the course of Neon Struct, both human and robotic. NPC behaviour and state changes are indicated through clear alterations to movement and animation, along with icons that appear above them; these latter UI elements, should you leave them enabled, remain visible through walls. Even without the additional non-diegetic feedback, it’s immediately possible to determine the state of any human NPCs you encounter. The internal states of the non-human NPCs you will be faced with later in the game are not as easy to read from a distance, especially if the light indicators on their front surfaces are not turned toward you. There are additional changes in their movement patterns though these are less pronounced that their human counterparts. NPCs in Neon Struct exhibit three primary states: Suspicious (…) which indicates they have heard or seen something but not enough to provoke a specific reaction; if you can avoid providing them with any additional stimuli this state will cool down rapidly and they will return to standard behaviour. Additionally, NPCs can also become Suspicious upon seeing another NPC in the second state, Searching (?). Triggered upon catching a glimpse of you – or receiving additional stimuli while already Suspicious – NPCs in this state will adopt a different pose and begin actively seeking you out. Once you have been detected, NPCs will ramp up to the final Alert state (!) and close to attack at full speed. If you can break visual contact with any Alert NPCs for long enough, they will ramp down through Searching and Suspicious over the course of a few minutes, eventually returning to their standard behaviour. Certain actions, such as triggering an alarm or opening or closing a door within several feet of an NPC, will cause them to ramp up immediately through Suspicious to Searching and close in on the cause of the disturbance. 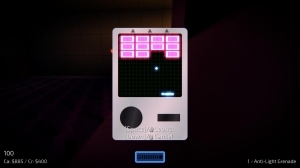 In place of standard locks, everything in the world of Neon Struct, from doors to computers to cameras, is secured by electronic devices that can be hacked through a simple mini-game take on Breakout. In most instances, losing the ball means a reset; however, when attempting to hack a security panel, failure will trigger an alarm, alerting all NPCs within your current location. All cameras in a given area can be disabled at once by hacking their connecting security panel. If you can find and reach these security panels, disabling them can make life easier, though it’s not always clear which cameras are controlled by a given panel. You can even find yourself accidentally setting off an alarm by failing to hack a security panel that controlled cameras you’ve already disabled individually. Each level starts with a variety of objectives, though these can change and be replaced as the level progresses. Certain levels, especially the public city sections where you are free to walk around and talk to NPCs, feature hidden optional objectives that will reward you with bonus items and information. With a few exceptions for narrative purposes, most levels require that you return to the starting position in order to exit the level. Though it establishes a high level structure early on, Neon Struct is not averse to altering this format. 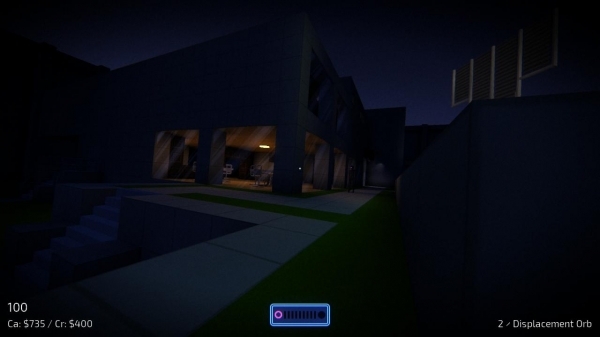 One level manages to evoke both the ‘Ton Hotel from Deus Ex, along with Ambush! from Thief II: The Metal Age as it turns an apparently safe public space into a tense escape across rooftops and city streets. Despite being one of the best levels in the game, this sequences does suffer from one of Neon Struct‘s rare instances of poor readability and unclear objectives. There is only one way out of the starting area and it’s easy to miss; the location you need to reach is obvious once you see it, but as it is beyond this choke point you could well spend several wasted minutes trying to break into inaccessible buildings because they might be the one you are looking for. There is also some confusion in terms of what the game judges to be a mission. 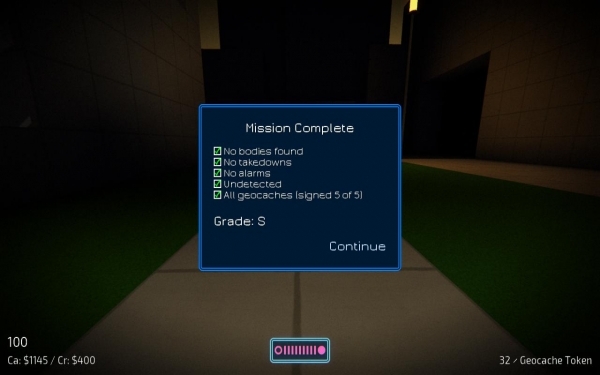 Each discrete level can be attempted again by accessing a menu option called “Missions”, however these do not line up with the missions as determined by the Achievements. Certain missions take place across multiple individual levels and it is each of these levels that can be replayed from the menu, rather than the entire mission. Not simply a mix up of nomenclature, this can cause confusion when you are trying to find all the geocache collectibles in a given level. It is not always clear if the five you have to find is per-level or per-mission, as you can transition between levels at unexpected points – especially during the second half of the game. This means you can miss certain items simply because you didn’t realise you were about to change levels, or you can spent your time searching fruitlessly for items in a level when they are actually in an entirely different level within the same mission. Levels can turn from exploration to evasion with little warning, or open up in other unexpected ways. Building on her core movement options, Jillian is able to steal and purchase a variety of single use items. These fall into two categories. Stims can be applied to yourself for a number of time-limited effects, such as deadening the sound of your footsteps or increasing your speed. Stims also play a limited but important role in the narrative. The other type of items are throwables: directed weapons and gadgets that cause a change in the state of the environment or NPCs. Throwable items include the HUDSON scrambler that will disable cameras and daze NPCs, and anti-light grenades that will extinguish all lights in the immediate area. There’s little consistency to when you can restock your resources, which can lead to excessive caution regarding their use; stims are the most readily replenishable, as you can find sellers in the various city areas. Though all of these items feed back into the underlying systems, none of them really push at the boundaries of what’s possible. Near the end of the game, you gain access to a displacement orb: a single-use throwable that will teleport Jillian to its location when it detonates. These threaten to cause a marked changed to your behaviour; however, they are extremely limited and, given the infrequency with which you are able to restock, you might hold-off experimenting with them in case you don’t have them when you need them. This speaks to the core of what is undercutting Neon Struct. 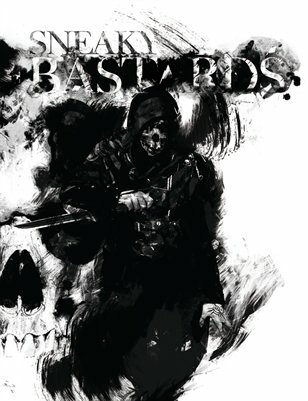 The game establishes a reliable stealth system and builds on it with a movement set and inventory that opens up the possibility space, but every time it feels like it’s about to push those boundaries and break out into something with a distinct systemic identity beyond its influences, it holds back. In something of a third act twist, Neon Struct gets weird, though never quite weird enough. Some of the levels in the closing sections are visually distinct from what has come before in a way that plays to the strengths of the clean simplicity of its art style. However, even here you are still avoiding static cameras and NPCs that follow predictable patrol patterns. One level in particular uses a spatial conceit that gave me a moment of pause as I considered all the possible ways this could impact the basic stealth systems – however, it’s only used once and then that level is over. Your success in each level is rated, with the highest grades awarded for ghosting and locating all the geocache collectibles, some of which are particularly well-hidden. There is one element where Neon Struct begins to developing a unique identity. It’s a hint of something that feels like it could have gone further. Framing the stealth levels are small city areas that owe a clear debt to the similar spaces in Deus Ex. You can talk to NPCs, complete side quests and purchase items from a variety of vendors. It’s here that you’ll engage in Neon Struct’s less-obvious stealth systems. Through certain actions in the game you will earn cash or credit, your totals of each are displays at all times on the UI. When purchasing items – be that equipment to take with you into subsequent levels, or food and drink to restore your health – you will be offered the opportunity to pay by either cash or credit. Presented without comment, this initially seems like a straightforward matter of resources or player expression. Maybe you’re flush with credit after completing a mission for the Agency, so using it to buy coffee makes sense. However, as the plot develops and Jillian Cleary’s situation changes, the choice of how to pay takes on a new aspect; credit and cash are not the same thing for a reason. Though never explained, there is an element of “social stealth” to Neon Struct. Wanted and on the run, you need to stay “off the grid”; using credit and being too open about your intentions to NPCs can lead to problems in subsequent levels as the forces arrayed against you are able to use your lapse in information security to get the drop on you. Eventually, you learn to be circumspect in your actions even when you are not obviously in a “stealth level” and your dialogue choices take on added significance when the person you’re talking to might be willing to sell you out. The architecture makes heavy use of glass walls throughout. Though they provide a means of observing the level ahead, NPCs can spot you just as easily through them, and with a solid wall of glass between you there’s no way to prevent them sounding the alarm. There’s a distinct feel to the stealth model pioneered by Thief: The Dark Project; with its straightforward systems interacting in messy and unpredictable ways, it offers an experience lived in ambiguity, in the grey space between control and chaos. When it’s at its best, Neon Struct evokes this very specific sensation. This “feel” can be a difficult to articulate, but Neon Struct manages to condense the heart of this experience into a shorter format, with its own aesthetic and narrative sensibilities, and while throwing in some elements of Deus Ex for good measure. Your dialogue choices take on added significance when the person you’re talking to might be willing to sell you out. Neon Struct shows a confidence it its own systems just as it’s coming to an end, leaving you wanting more. It’s too easy to push up against the bounds of its possibility space, as the range of options available to you and the potential consequences are limited in scope in a way that serves to make your full range of choices clear at every moment at the expense of sustained depth. The game often suggests it is going to push one or more of its systems that little bit further, expanding the possibility space in a way that feels truly unique, and it never quite manages it. 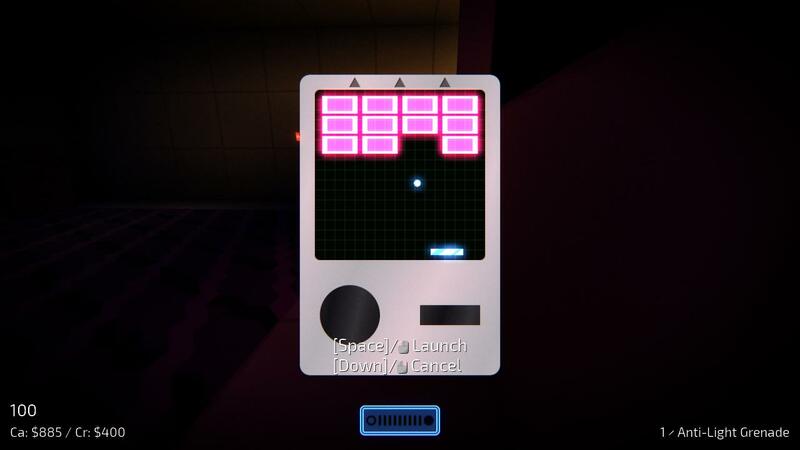 One more level, one more type of NPC, one more item – Neon Struct needs something to give its systems a shock, to take it from a smartly-designed homage to the games of Looking Glass Studios and Ion Storm Austin, and mark it out as something unique in its own right. Neon Struct is a well designed and intelligently-executed game that – despite always feeling like it’s just about to – never quite manages to escape the shadow of the games to which it is clearly indebted. But when your influences include some of the best stealth games ever made, even managing to come close is worthy of praise.